Dr. Katharina Lorenz, director of Digital Humanities Centre at University of Nottingham, has been exploring how to connect with the ancient finds at Nemi through twenty-first century digital means. Following a successful talk at Nottingham Castle Museum as part of the Treasures of Nemi exhibition programme she shares with us her experience of 3D scanning the star exhibit of the show, the herm of Fundilia Rufa. 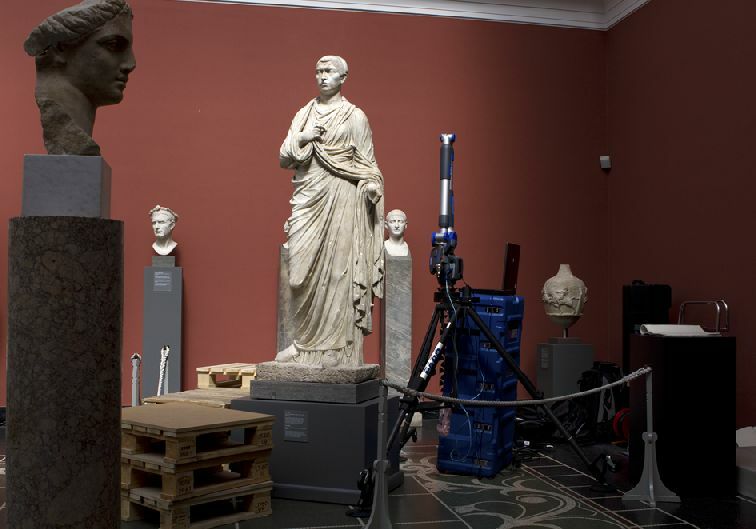 Over the last two years, I have been working on a project concerned with the 3D scanning of the two portrait statues of Fundilia, the herm statue in the Nottingham Castle Museum and Galleries (NCMG) and the full-body statue in the collection of the Ny Carlsberg Glyptotek in Copenhagen. This research is thoroughly multi-disciplinary: it involves archaeologists (myself, Ann Inscker at NCMG, and Jane Fejfer and Mette Moltesen in Copenhagen), Human-Computer-Interaction specialists (Damian Schofield and Matthew Andrews at SUNY Oswego) and a forensic anthropologist (Stephanie Davy-Jow at the University of South Florida), along with Nottingham University Classics students, who helped scanning the herm statue in 2011. So why 3D-scan Roman portrait statues? There are two reasons why I started this project. 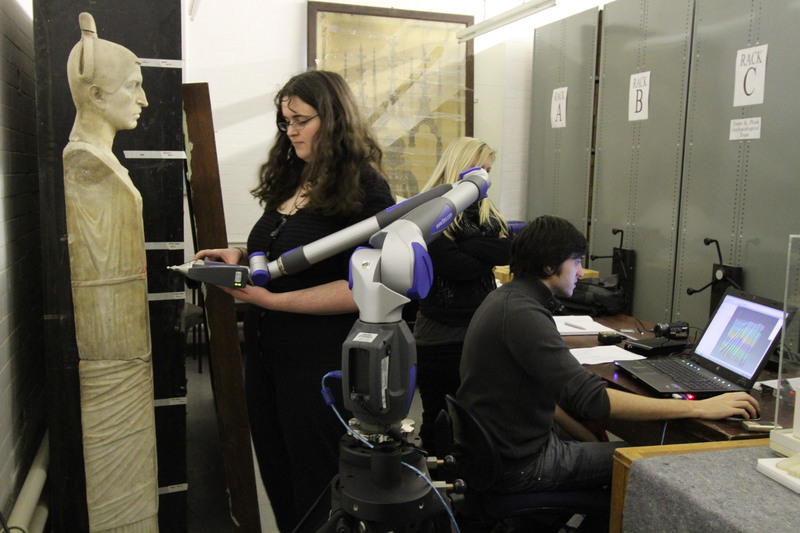 The first, basic reason is that 3D scanning technology facilitates enhanced artefact documentation, a major concern in archaeological heritage management: with 3D-scanning technology, an object – in our case, a portrait statue – can be reproduced digitally in a non-invasive, quick and cost-effective way. In a case such as that of the two Fundilias this also means that distributed objects can be reunited virtually with each other, and within their original context, in order to conduct different types of contextual analysis (how did the statues appear in the room in which they were put up? When/how would visitors to the sanctuary see them? ), without the need to travel from museum to museum or to the site. In addition, this type of enhanced artefact documentation can also help to bring out object details not visible to the human eye – the 3D scanner with its high visual resolution works as if a microscope. So, for example when 3D-scanning the herm statue in Nottingham, the student team observed a sequence of indentations on the mantle of the statue, so far never recorded, which we were later able to interpret as a decorative pattern, and an indication that the statue had originally been painted (this is now confirmed after examination by the Copenhagen Tracking Colour project). 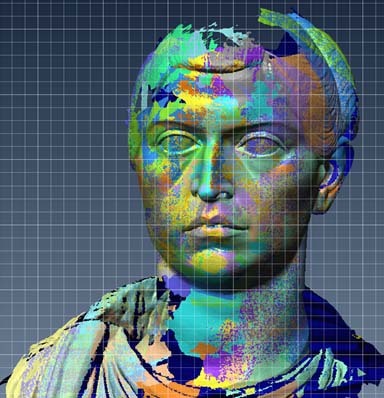 The second reason for choosing 3D-scanning technology as a means of studying Roman portrait statues is that the scanning produces large data sets – sets of quantitative measurements of the statues – which can support different types of advanced statistical analysis. This part of the project is still ongoing. What interests me here is to what extent the measurements that the 3D scans produce – measurements capturing the statues in their spherical volume with an exactitude that could not be produced by the more traditional types of manual measurement – can help us to understand the formal and stylistic relationship of the statues better. The central questions for a classical archaeologist like me here are: how similar are the two portrait representations (we know they both show Fundilia because the inscriptions on the statues tell us)? Can we tell whether one was made before the other, ie. one statue served as the model for the other statue (this would have implications for the dating of the statues, and – possibly – also for their respective importance)? Key to answering these questions is close scrutiny of the portraits of each statue, their faces. Traditionally, classical archaeologists rely on visual autopsy for this type of enquiry: they study the portraits very closely and compare all the individual features in order to elicit an interpretation. But this type of visual autopsy comes with an error margin caused by subjectivity: different interpreters might quite literally look at things differently. The field of Roman portraiture studies has for the past century been concerned with reducing this element of subjectivity – by means of developing robust protocols that make the analyses and interpretations of individual interpreters transparent, comparable, and falsifiable. So scholars have used comparable ways of photographic documentation, and similar patterns of description. What interested me when starting the project (and still does!) is to what extent the quantification of a portrait (as a type of objective description, because not dependent on the eye sight of a single individual) could offer a new, stronger basis for the formal and stylistic analysis of Roman portraiture. Comparing facial measurement, even if gained by an “objective” machine such as a 3D-scanner, is not easy – for one, there is the question which measurements to compare. And a decision here, as any other type of interpretation, automatically introduces an element of subjectivity into the analysis. This is where my colleagues from Human Computer Interaction and Forensic Anthropology come in: they developed a standardised system of facial landmarks, which are particularly relevant for facial identification and against which any face can be mapped. And that is what we also did with the two Fundilias, based on the data collected from 3D-scanning them. Once the faces had been landmarked, the co-ordinates of the facial landmarks were imported into a statistical software package (MiniTab 16, © Minitab 2012) and my colleagues started to examine the statistical distance and spatial mean information relative to the three-dimensional coordinates of the anthropometric landmarks. The outcome of this statistical analysis showed that the density of coordinates differs between the Nottingham and the Copenhagen portrait of Fundilia – or, in simple words: if the portrait heads were to be super-imposed, there would be significant discrepancy. More specifically, the variations suggest that the areas of the eyes of the two statues are highly similar in terms of relevant proportion and the areas of broader facial landmarks such as the ear or jaw have greater differentials. The tighter and more precise areas that are centred in the middle of the face tend to correlate positively whereas the broader areas have a more negative correlation. This result confirms the hypothesis that Roman artists, when copying portraits, concentrated primarily on the central axis of the face along the nose, and were less concerned about the other areas of the face. We are currently working on the next stage of the project, with further analysis of the mathematical data and visual feature comparisons between the statues – more results to follow soon! The results of the first stage of the project can be found here. This entry was posted in Discovering the Past. Bookmark the permalink.